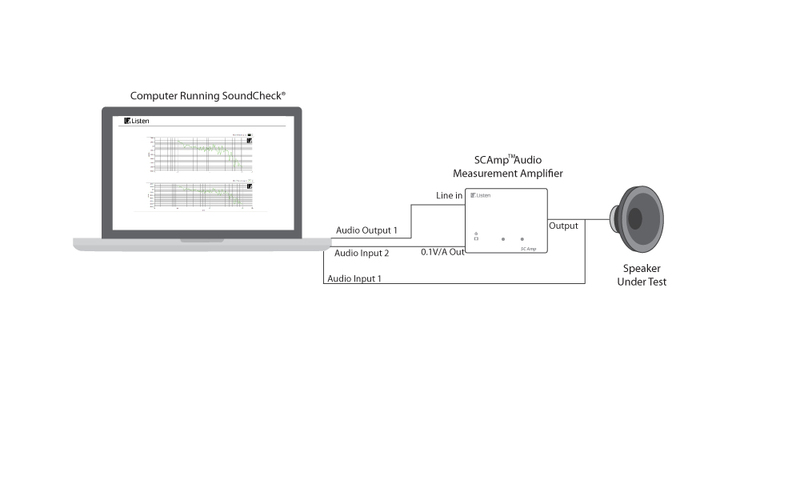 Impedance Measurement Sequence – Dual Channel Using Math Post-Processing – Listen, Inc.
an alternative to the traditional SoundCheck single channel impedance measurement method. This sequence demonstrates an alternative to the traditional SoundCheck single channel impedance measurement method. A stepped sine sweep from 20 Hz to 20 kHz is played through the speaker while the signal across the loudspeaker terminals is recorded by Direct In 1 and the signal across the sense resistor (impedance box) is recorded by Direct In 2. A heterodyne analysis step is then applied to calculate the fundamental response from both inputs and a math post-processing step divides Fundamental A (speaker terminal voltage) by Fundamental B (voltage across sense resistor). A post-processing step corrects for the value of the reference resistor before displaying the final impedance curve. 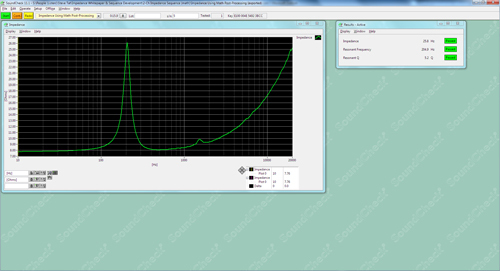 The curve is then post-processed to calculate resonance frequency, maximum impedance and Q of the resonance peak. A set of arbitrary limits steps are also provided to generate pass/fail results. Connect Input 1 of the sound card across the terminals of the speaker under test. Use a balanced cable with a ¼” TRS plug or XLR at the sound card and a ¼” TS (or dual banana, alligator clips, etc.) at the speaker – wired for “floating” ground (no shield connection at speaker) for this connection. Connect the output of the impedance box to Input 2 of your sound card. Use a balanced cable (1/4” TRS) for this connection. You are now ready to start the sequence. Note: When first opening the sequence, you may be prompted to add calibrated signal channels named “Speaker” and “Sense Resistor”. These channels should be linked to Direct in 1 and Direct in 2 respectively. Connect Input 1 of the sound card across the terminals of the speaker under test. Use a balanced cable with a ¼” TRS plug or XLR at the sound card and a ¼” TS (or dual banana, alligator clips, etc.) at the speaker – wired for “floating” ground (no shield connection at speaker).onnect Input 2 of the sound card to the SC Amp 0.1 V/Amp output. Use a balanced cable for this connection. 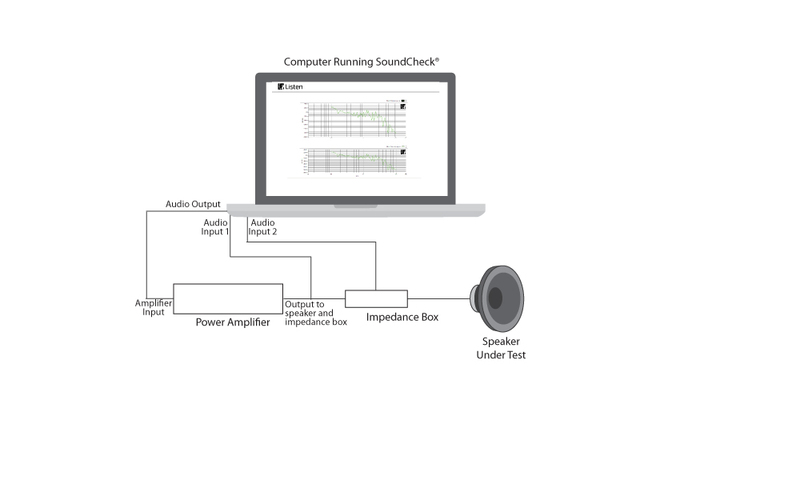 If more than 2 input channels are available, a microphone can be used to record and analyze the acoustic output of the device under test.